Ця сторінка також доступна українською. Go to the outline, A History of the Jewish Community of Rohatyn. Soldiers and residents of Rohatyn on the square, ca. 1916. Source: Piotr Lewicki Collection. 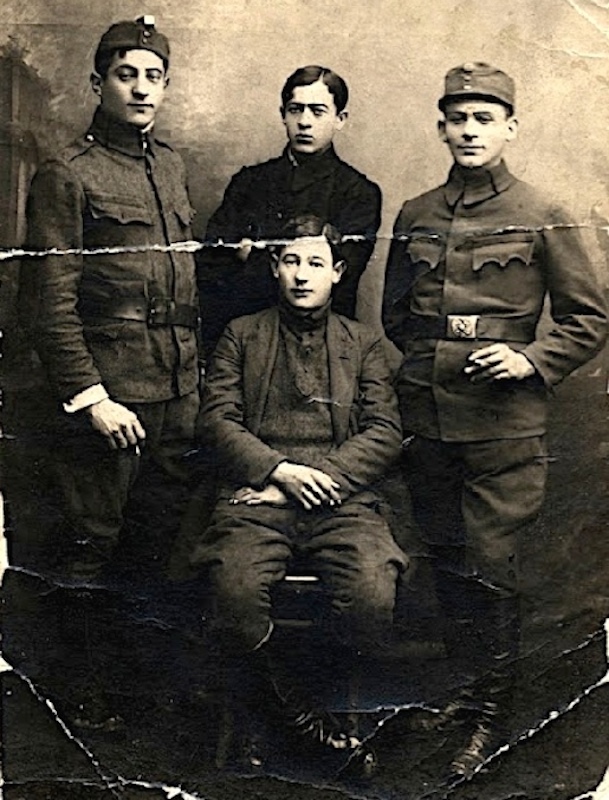 Presented here is a timeline of Jewish life in Rohatyn during World War I, once known as the Great War (and “the war to end war“). From the trigger to the treaty, it was a brief period of only five years, and military engagements on the Eastern Front where Rohatyn sits lasted barely four years, but the war overturned public life for all of Rohatyn’s families and businesses, and many of the prior social and political relationships. Many books and entire websites have been dedicated to studying the war and its effects; this page draws from a few of those and from other sources to provide a glimpse of the war’s impacts on Rohatyn’s Jews. This page is part of a selective history of the Jewish community of Rohatyn. This history comes from many sources and many perspectives, Jewish and otherwise, and includes historical facts (plus a few legends) which illuminate life in Rohatyn’s past to better understand its present. Most of the sources are linked inline or listed at the end of this page. 1914 Aug 23~25 – Austria-Hungary sees its first military success in the war near the Galician border, in the Battle of Kraśnik, some 300km northwest of Rohatyn. This initial battle sets off a series of engagements along the extensive Galician front, now collectively known as the Battle of Galicia. 1914 Aug 26 – The fighting moves closer to Rohatyn, in the Battle of Komarów, about 200km to the northwest; Austria-Hungary will be successful there. But another battle starting at the same time on the Zolota Lypa river just 25km east of Rohatyn proves disastrous for Austria-Hungary; their Third Army with only three corps is overwhelmed by numbers and strategy, and is forced to retreat rapidly westward. Rohatyn at the center of the Battle of Hnyla Lypa, from an Austrian history of the war. 1914 Aug 28 – Austria-Hungary regroups on the west bank of the Hnyla Lypa river and attempts to defend a battle line running the river’s entire 75km length. Like the river, the battle line passes directly through Rohatyn; an Austria-Hungary infantry corps set up camp in the Rohatyn market square. 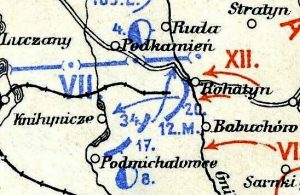 [5, p.93] Fighting occurs in and around not only Rohatyn but also Peremyshlyany, Lypivka (Firlejów), Kniahynychi, Svirzh, Novi Strylishcha, and Pidmykhailivtsi. [3, v.1/p.284~291] In Bilshivtsi, “the center of the little town was quickly reduced to a heap of ruins”. 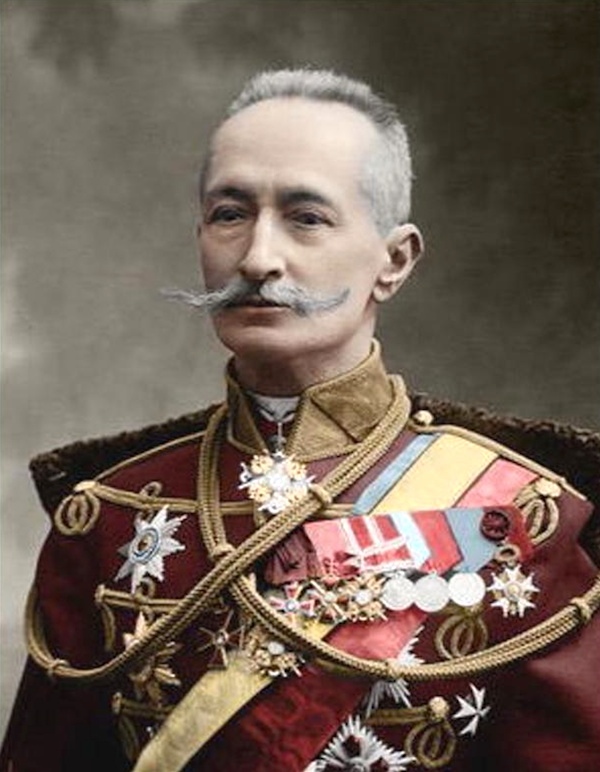 [8, v.3/p.252] Outnumbered more than 2:1 in soldiers and 3:1 in artillery, by the 30th, Austria-Hungary is crushed and retreating; the VII k.u.k. 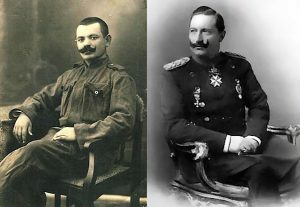 Corps under General Eduard von Böhm-Ermolli and Field Marshall Hermann Kövess (later appointed ceremonial Commander in Chief of the Austria-Hungary forces) is unable to prevent a significant loss at Rohatyn. The armies continued moving toward Lemberg/Lviv; one of the successful Russian generals, Aleksei Brusilov, will return to this area later in the war. 1914 Sep 3 – Austria-Hungary troops evacuate Lemberg [3, v.1/p.297], and during the next weeks Austria-Hungary’s armies withdraw from most of Galicia. 1915 May 2 – With half of the armies on both sides of the Eastern Front lost to casualties, Germany and Austria-Hungary join forces to attack the Russian III Army in the south near Tarnów and Gorlice, and a breakthrough is almost immediately achieved, with four Central Powers armies overrunning the shallow trenches of Russian troops retreating eastward. 1915 May 16 – Central Powers armies under August von Mackensen establish bridgeheads over the San River, the historical line between western and eastern Galicia. 1915 Jun 3 – Germany and Austria-Hungary re-take the fortress city of Przemyśl, which had been surrendered to Russia ten weeks earlier after two sieges. 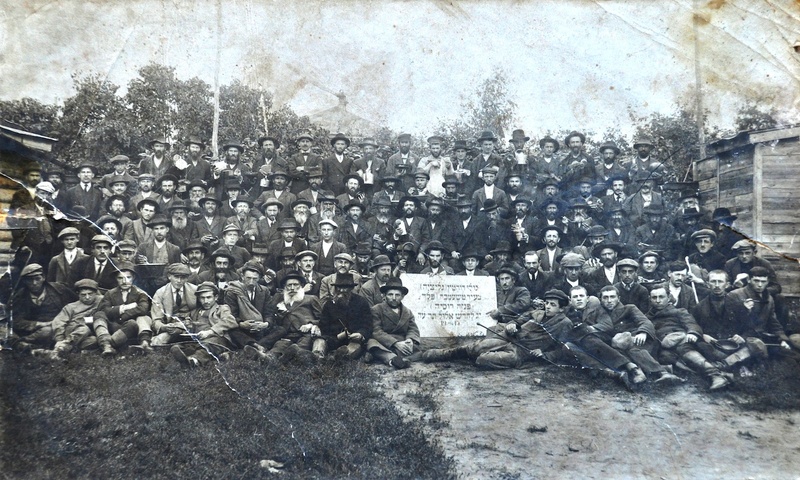 Rohatyn Jewish men deported to Chembar, Russia during World War I. 1915 Jun 21 – Grand Duke Nicholas, the Commander in Chief of the Russian Armies (and first cousin to Tsar Nicholas II), orders his troops to abandon Galicia, beginning the Great Retreat. Less than three months later, the Tsar will remove his cousin and take the Commander position himself. 1915 Jun 22 – Von Mackensen’s Austria-Hungary forces re-enter Lemberg/Lviv. 1915 Jun 26~30 – Intense fighting spans the Hnyla Lypa River for the second time in ten months. On the 30th, Austria-Hungary troops are able to re-cross the river near Rohatyn. [8, v.5/p.339; 3, v.2/p.620~623, 633~634] Fighting continues eastward, re-tracing the paths and defensive lines of the previous year. A bird’s-eye view of the destruction of Rohatyn. Source: Tomasz Wiśniewski Collection. 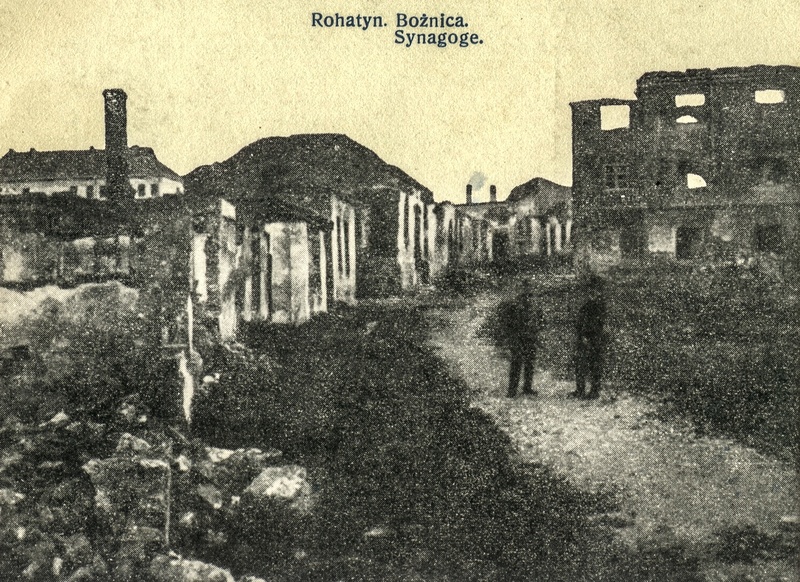 Quiet time in Rohatyn, September 1915. 1915 Autumn – With the southern end of the Eastern Front stuck west of Ternopil, some 50km east of Rohatyn, soldiers of the Central Powers armies have some time to survey damage to towns already affected by two passes of battle lines in the previous year. 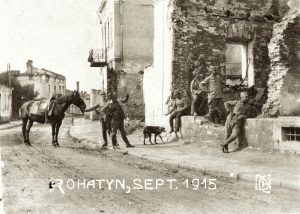 Compelling scenes in Rohatyn are captured in a number of photographs; some of those scenes are printed on postcards soon after and for the next years, others make their way via military post to Vienna, where they survive to be rediscovered a hundred years later. The ruins of Rohatyn’s buildings, and the remaining residents going about their business as best they can, seem somehow picturesque despite the severe hardship they reveal. The soldiers, most of whom are only visitors from faraway places, strike proud or comic poses beside the rubble, with townspeople and animals, and sometimes with their equipment. 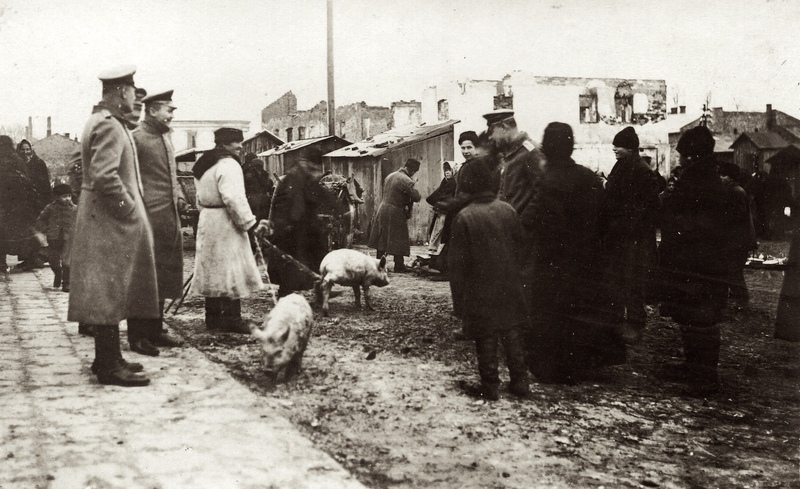 In addition to selling and buying food and other goods, the residents are seen working around the damage, getting by, not knowing when the war will end or under which empire they will find themselves. Contemporary postcards showing the war damage in Rohatyn. Source: Polona. 1916 – A curious series of photographs is taken by the German military in the landscape around Rohatyn, probably in the first half of the year. It appears to show practical exercises for soldiers of the South Army in the use of various tools of battle, including hand grenades, flame throwers, and machine guns. Several of the images simply show the impact of artillery fire; others show groups of officers posing. 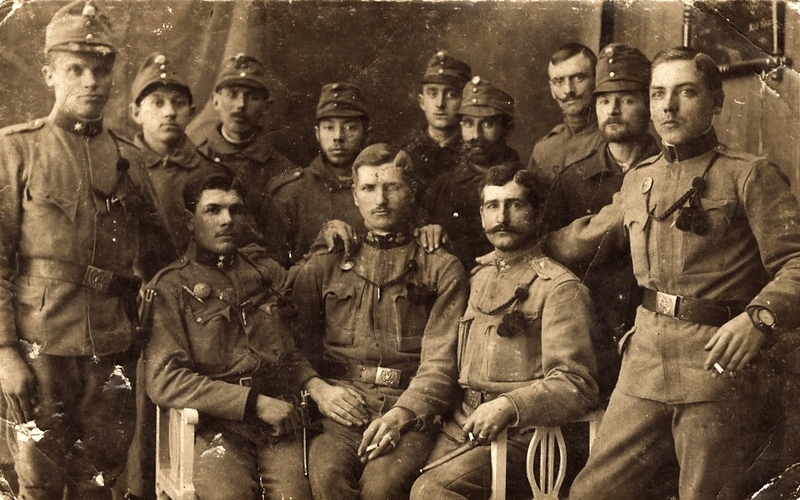 Why the photographs were taken or why Rohatyn was chosen for the training courses is not known, although the town was a significant reserve point for Central Powers armies after the first year of war. Military training exercises around Rohatyn, 1916. Source: Österreichische Nationalbibliothek. General Brusilov in 1913. Source: Imperor. 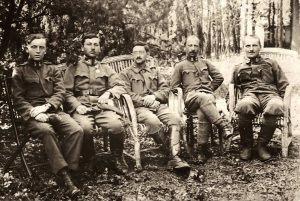 1916 Jun 4 – The massive Brusilov Offensive begins in Eastern Galicia, along a battle line that stretches from Pinsk to south of Chernivtsi, a length of more than 400km. Russian forces make significant westward gains in the first week around Lutsk, Buchach, and Chernivtsi, but then the advance slows. 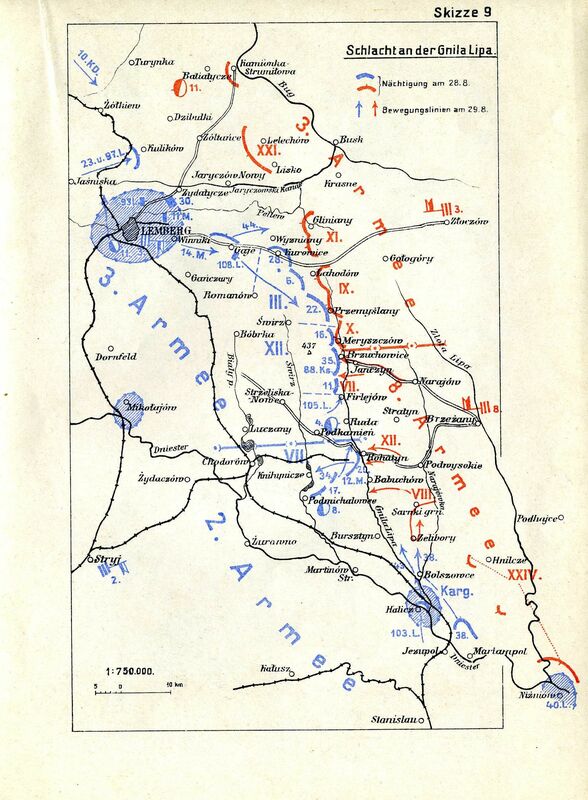 By the time the offensive is finally stopped by combined Central Powers efforts and Russian material shortages three months later, the front has again crossed the Zolota Lypa river and the fighting is within 25km of Rohatyn; the Ternopil-Rohatyn rail line features in strategy and battles in the last month. [3, v.3/p.82~83, v.5/p.242] The operation is the deadliest of World War I, with an estimated 1.5 million dead, wounded, or captured soldiers, and untold civilian casualties; it also cripples the Austria-Hungary military force for the remainder of the war. General Brusilov‘s strategy and innovative tactics are celebrated, but the cost to Russia’s economy and fighting force contribute to political instability at home. 1916 Nov – Russia’s Duma cites the increasing strain of the war on the empire’s military and material resources as a risk to public order in a warning to Tsar Nicholas II to establish a constitutional form of government; the emperor ignores the warning. 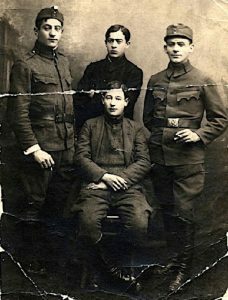 Velvel Wald of Rohatyn (standing third from left) with his fellows in uniform. 1916 Nov 21 – Emperor Franz Joseph I of Austria dies, after ruling his empire for more than 65 years. He is buried in the imperial crypt in Vienna (where monarchists continue to leave flowers). 1917 Mar 8 – Following a month of strikes and demonstrations, on International Women’s Day more than 50,000 women workers strike in Petrograd, as part of larger political movements in Russia. Two days later, nearly every industrial plant in the city has been shut down. A day later, the Tsar orders the army to restore order by force, but troops mutiny and government authority collapses. 1917 Mar 15 – Tsar Nicholas II of Russia abdicates the throne, for himself and his son. The next day, the former Tsar’s brother declines the throne. A “dual power” government is established between liberal aristocrats and the socialist worker’s council. 1917 Apr 6 – The United States declares war on Germany. Declaration on Austria-Hungary comes in December, and US troops begin arriving on the Western Front in large numbers the following year. 1917 Nov 2 – The UK foreign secretary sends a public letter to the leader of the British Jewish community, declaring “His Majesty’s government view with favour the establishment in Palestine of a national home for the Jewish people”. The “Balfour Declaration” represents the first expression of public support for Zionism by a major political power, while intending to protect the rights of existing non-Jewish communities in Palestine, and the rights of Jews in other countries. 1917 Nov 7 – The October Revolution effectively removes Russia from the war. Vladimir Lenin’s Bolsheviks organize armed forces into an armed insurrection in Petrograd, occupying the Winter Palace and overthrowing the provisional government. The next day, a decree on peace written by Lenin and passed by a second congress of soviet deputies proposes an immediate cessation of international conflict without annexations. Elections a few days later fail to create a stable government, and civil war begins in Russia. 1918 Jan 8 – US President Woodrow Wilson delivers his “Fourteen Points” speech to the US Congress, outlining his aims for US involvement in the war and subsequent peace. Included among the points are self-determination for the people of Austria-Hungary (X), and an independent Polish state (XIII), both of which will bear on later peace negotiations and post-war life in Rohatyn. 1918 Feb 18 – Under a cease-fire with Russia and in the midst of two months of negotiations for peace, the Central Powers attack nearly non-existent Russian forces in a broad front through more than 240km in 11 days in Operation Faustschlag, which will become the last engagement on the Eastern Front. 1918 Mar 3 – The Treaty of Brest-Litovsk is signed by Soviet Russia and the Central Powers; Russia renounces claims on Poland, Ukraine, Finland, and the Baltic states. 1918 Jul 16 – The former Russian Tsar Nicholas II and his family and companions are executed by Bolshevik troops in Yekaterinburg. A view of the old Jewish quarter of Rohatyn (vul. Valova today), late in the war. Source: Tomasz Wiśniewski Collection. 1918 Oct 31 – With the brief Aster Revolution, Hungary withdraws from the “personal union” with Austria, officially dissolving Austria-Hungary as a dual monarchy. 1918 Nov 9 – Two weeks of military and civil revolt lead to the collapse of the German Empire and the abdication of Kaiser Wilhelm II. Revolution will continue on and off for months until the establishment of a new German Reich with the Weimar Constitution. 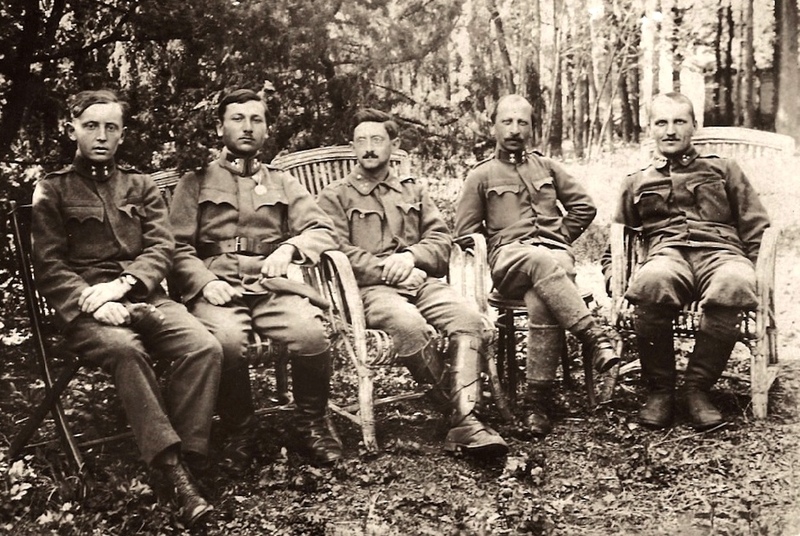 1918 Nov 11 – An armistice is signed between the Entente Powers and Germany in a carriage of Ferdinand Foch’s private train in the Forest of Compiègne, 60km north of Paris. On the same day, Karl I of Austria issues a proclamation relinquishing his role in the administration of the Austrian state, but without abdicating. The fighting of World War I ends at 11am. 1919 Jun 28 – Terms of peace are formally agreed in the Treaty of Versailles, five years to the day after the assassination of Archduke Franz Ferdinand and his wife. In addition to the royals, more than 9 million military personnel and 7 million civilians died as a result of the war, a combined average rate of some nine thousand per day – more than the population of Rohatyn at the time, every day. Wikipedia articles in English (including “Rohatyn“, “World War I“, and “Timeline of World War I“) and in Ukrainian (including “Рогатин“, “Перша світова війна“, and “Хронологія Першої світової війни“); additional articles as linked or noted. Mark Von Hagen; War in a European Borderland: Occupations and Occupation Plans in Galicia and Ukraine, 1914~1918; Seattle, University of Washington Press, 2007. 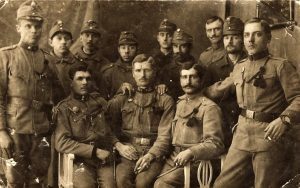 Österreich-Ungarns letzter Krieg 1914~1918, Band I–VII; Edmund Glaise von Horstenau (Hrsg); Verlag der Militärwissenschaftlichen Mitteilungen; Wien, 1930~1938; Österreichischen Bundesministerium für Heereswesen und Kriegsarchiv; OÖ Landesbibliothek. English translation Austria-Hungary’s Last War 1914~1918; Stan Hanna; undated, Comroe Studios. Page numbers refer to the English translation. Encyclopedia of the Jewish Communities of Poland (Pinkas ha-kehillot Polin), Volume II (Eastern Galicia); eds. Danuta Dabrowska, Abraham Wein, Aharon Weiss; by Zvi Avital, Danuta Dabrowska, Abraham Wein, Aharon Weiss, Aharon Jakubowicz; Yad Vashem, Jerusalem 1980 (in Hebrew). Online English version hosted by JewishGen. Pages 506~510 on Rohatyn coordinated by Alex Feller, English translation by Ruth Yoseffa Erez. Section “Jewish presence from its beginning until 1919”. Yizkor Book for Rohatyn: The Community of Rohatyn and Environs (Kehilat Rohatyn v’hasviva); eds. M. Amitai, David Stockfish, and Shmuel Bari; Rohatyn Association of Israel, 1962 (in Hebrew). Online image version hosted by the New York Public Library. Online English version hosted by JewishGen, coordinated by Michael J. Bohnen and Donia Gold Shwarzstein. Page numbers refer to the printed book. Jüdisches Archive; R. Löwitt, ed. ; Jüdisches Kriegsarchiv; Vienna, 1915~1917; Issue 4~5, January 1916; “Von der Russenherrschaft in Rohatyn (Galizien)” (From Russian Rule in Rohatyn, Galicia); English translation by Edgar Hauster for the RSRG. The Times History of the War; Volume 3 (1914); Volume 5 (1915); The Times; London, various dates. The Enemy at His Pleasure; S. Ansky; edited and translated by Joachim Neugroschel; Metropolitan Books; New York, 2003. First published in Yiddish in 1925 under the title Khurbn Galitsiye (The Destruction of Galicia). See also the general references on the history outline page and this helpful Rohatyn WWI resource listing on the public RSRG website.